Pollution from thousands of ships that pass through Hong Kong's Victoria Harbour is a growing concern that the shipping industry has been trying to address by asking for mandatory regulations on using cleaner fuel. Hong Kong's picturesque Victoria Harbour is an aquatic highway where cargo carriers, cruise ships, tankers, pleasure craft and the legendary Star Ferries navigate around each other all day long. Massive ocean-going vessels glide by the skyscraper-lined shores as the ferries criss-cross the harbour between Hong Kong Island and the Kowloon Peninsula. Hong Kong’s peaks lie in the background and it's a picture postcard scene for tourists snapping photos – on the days when smog doesn't obscure the view. "It's a bad advertisement for Hong Kong if we want to promote our tourism," Simon Ng said about the haze that hangs over the famous harbour. Ng is a researcher at Civic Exchange, a local think-tank that produced a startling report last fall that showed how deadly the emissions being spewed into the harbour air can be. An estimated 519 premature deaths a year are linked to sulphur dioxide emissions from ocean-going vessels that traverse the Pearl River Delta, a region shared by Hong Kong, Macau and China’s Guangdong province. Most of the deaths – 385 – are suffered by Hong Kongers. These are just the deaths blamed on emissions from ships, air pollution generally contributes to many more deaths a year in this city of seven million. Civic Exchange's report added to a body of research on the public health impact of the shipping industry in Hong Kong and Ng said it can no longer be ignored by the government. "In the past they overlooked the issue, but now we have evidence to show that ship emissions are a very serious issue and we need to tackle it," he said. Hong Kong's container terminals cover 279 hectares along Victoria Harbour and there are many apartment buildings nearby. Outside one of them on a sunny afternoon this week elderly residents were milling about and playing checkers and cards. The air pollution index for their neighbourhood was rated high that day, which means there could be long-term effects from prolonged exposure. Power plants used to be Hong Kong's biggest polluter, but with progress now being made on that front, the focus is shifting to maritime pollution. Marine vessels were the largest source of nitrogen oxides and sulphur dioxide in 2011 and ships docked in the harbour accounted for 40 per cent of total emissions within Hong Kong waters. Statistics for 2012 should be released soon and they aren't expected to be any better. Meagan Fitzpatrick has been posted to Hong Kong to bolster CBC's coverage of a dynamic region of the world. 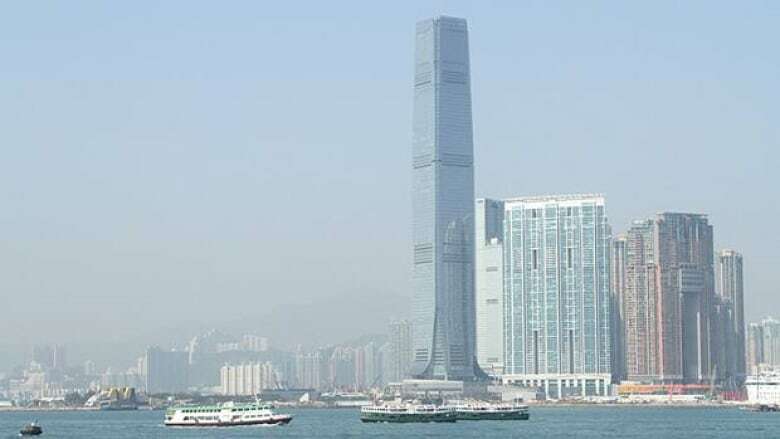 Hong Kong is known as an international financial centre, but there is much more to it than that, and it has close connections to Canada. The city of seven million hosts nearly 300,000 Canadians, and about 500,000 people of Hong Kong descent make their home in Canada. Meagan is a senior online writer who covers national news and federal politics in CBC's Ottawa bureau. What's being done about the growing problem sounds like an anomaly: major associations representing the shipping industry are actually pleading with the government to be regulated. They want rules imposed on them that would force ships to use cleaner fuel while in port, despite the added cost. "Yes, it is bizarre," Arthur Bowring, managing director of the Hong Kong Shipowners Association, acknowledges. "It is very odd that the industry should be doing this, but the point is we live in Hong Kong, we taste the sulphur in the air as much as anybody else. We know something's got to be done." Bowring gave up running because the air pollution was taking a toll on his heart and he knows people that have left in search of cleaner air. In the absence of regulations, the industry worked with partners such as Civic Exchange to launch its own voluntary scheme called the Fair Winds Charter. Nineteen companies signed on to a two-year commitment to switch to fuel with 0.5 per cent sulphur or less. They've been pushing the government to level the playing field by making the switch mandatory because many companies are still using cheaper, dirtier fuel. The typical sulphur content in fuel used in Asia is 2.8 to three per cent. "There are still operators that are getting a cost advantage by doing the wrong thing," said Tim Smith, chairman of the Hong Kong Liner Shipping Association. He's also chief executive of the North Asia region for Maersk Line, one of the world's biggest shipping companies, and he says his company spends up to $2 million extra each year to use cleaner fuel in port. "We are also citizens and we can see the impact of pollution," he said. "We'd rather be part of the solution than the problem." The Fair Winds Charter was due to expire at the end of December but last Friday, the shipping associations said it would keep going through 2013. They agreed to the extension because the government is answering their call for regulation. Leader Leung Chun-ying said in his policy address in mid-January that the government is now working on legislation to make fuel-switching mandatory and new laws will be introduced later this year. The industry is also pleased with an incentive scheme introduced a few months ago, offering a 50 per cent discount on port fees when cleaner fuels are used. The shipping industry's early efforts, and the government's recent commitments, are earning applause from Civic Exchange. "This is really a change in attitude," said Ng. His group estimated that switching fuel at berth will drop the number of premature deaths to 197 and other measures, such as speed reduction to burn less fuel, would save even more lives. "Hopefully it will pave the way not just for air pollution but for other environmental issues. I think this is what Hong Kong people would like to see. It affects everyone, everyone has to breathe."